PowerPoint and presentations seem to go hand in hand. If you’re on the hunt for some new training tools, however, PowerPoint might be just up your alley. 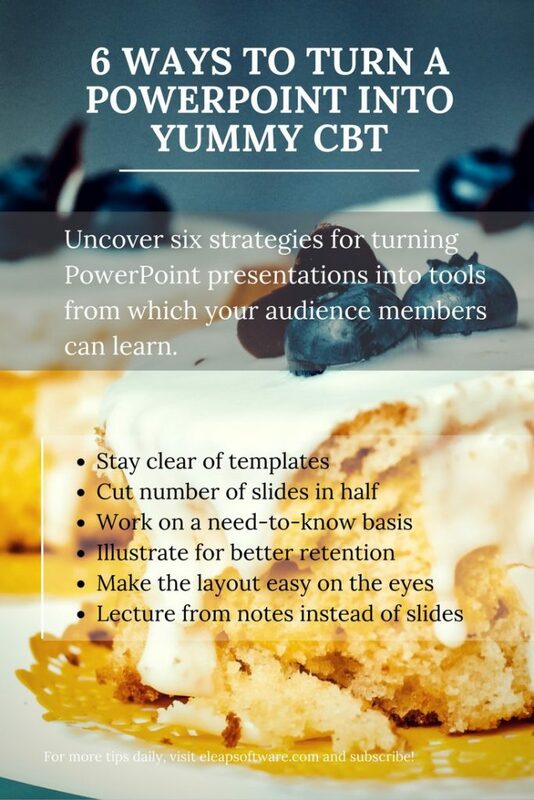 When used appropriately, PowerPoint slides become supplements that are effective in driving home your points in training seminars, conferences, and sessions. Uncover six strategies for turning PowerPoint presentations into tools from which your audience members can learn. Typical PowerPoint presentations have a template that carries over from slide to slide. This format can easily put audience members to sleep. Vary the layout and content of the information you share so that it changes from slide to slide. If you want to use your company logo or some template information, avoid placing it in the same place on each slide, so there is some variation. Avoid learning overload by cutting down the number of slides you use. If your standard presentation uses 12 slides, then cut your learning presentation down to six slides. While your slide can support the information that you are teaching during your training session, you don’t need to cram all of the information onto the slides. Include information on your slides that audience members need to know. Leave the extraneous information off the slides. Use bullet points, words or graphics to supplement what you’re talking about. You are the best training tool the audience has. You can leverage the PowerPoint slides as your co-star. Humans tend to retain information from pictures, graphs, and illustrations better than from reading the text. When possible, opt for illustrations over straight text. Audience members tend to walk away with higher retention of the information. In the end, this is your goal in training – having audience members walk away with knowledge they had prior to stepping into the room. Of course, it does not hurt to be able to provide detailed tracking and documentation evidence of your training program. Training tracking software tools will easily help you provide this reporting and documentation. Attract the audience with attractive features on your slides. Choose background pictures and colors that are pleasing, rather than ones that hurt the eyes. Use fonts that are easy to read, especially from afar since audience members are viewing the slides from different vantage points throughout the room. Use your notes for talking points about the slides. This helps you avoid cramming all of the information that is part of your training onto PowerPoint slides. While slides can support what you are saying, the slides should not be the sole place where everything that is part of the training is. Applying this strategy assists you in applying some of the other strategies as well. PowerPoint is synonymous with presentations. When you apply one or more of these six strategies, however, your PowerPoint presentations quickly become the training tools you need to create effective learning environments so that you can improve performance, reduce costs and strengthen compliance. Because online training development can be complicated for some organizations, using the PowerPoint to e-learning presentation option should allow you to get in the game. Get more free resources articles and White Papers here.